Finally I am on the track. This has been a long time coming. In 1984 I was all set to hit the track on my freshly bombed 83' Hailwood Pantah but alas, life got in the way and put a hold on the dream. Living at the bottom of Mount Tamborine for about 5 years allowed me to get my fix for the twisties - Just going to work and back was a thrill. I had started to get the twitch again after watching the Historics at Morgan Park in about 2009. I then set about to find a ride. 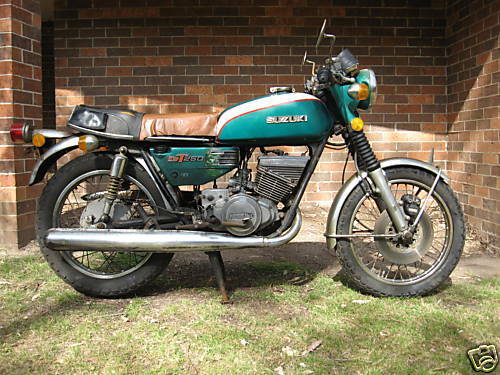 In 2010 I found the GT250 Suzuki on good old eBay. The bike soon landed at my place in all its rusty glory, it was complete and a runner so I was happy. I thought a set of new crank seals would be wise, so the strip down began. That let me discover that the big ends were shot... Lots of dollars and some more grey hairs later, the crank had new seals, bearings, rods, pins and was rebalanced. While the barrels were off, I had a bloke I know play with the ports to get rid of the dodgy casting marks that are left from the factory. I have also fitted an ignition system to do away with the battery.